Pinky Otto cropped sweater, GAP pleated skirt (similar here), Jacket from Alter, Alexander McQueen clutch (more styles here), Rag & Bone ankle boots. One of my favorite trends is mixing prints, so one can imagine my delight when Micol and I met up for drinks and dinner at OTB one night and she showed up wearing this look. To me, this is pattern play at its finest. The shades of tan and orange complement each other perfectly, as do the sizes of the patterns themselves. Confused how to make patterns work together in your wardrobe? Just follow Micol's lead and pair together pieces in the same range of the color spectrum. Another tip to remember: small, intricate prints work best with larger, louder prints. Like this houndstooth sweater with the animal print above. And lastly, tone down the rest of the outfit so that the prints are the focal point of your look. 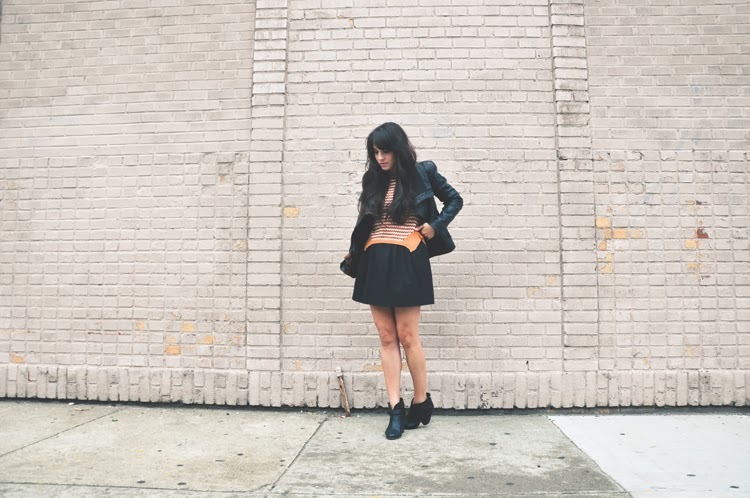 Here, Micol kept things sleek with a black flared skirt, leather jacket and ankle boots. love the whole outfit and bag is gorgeous! 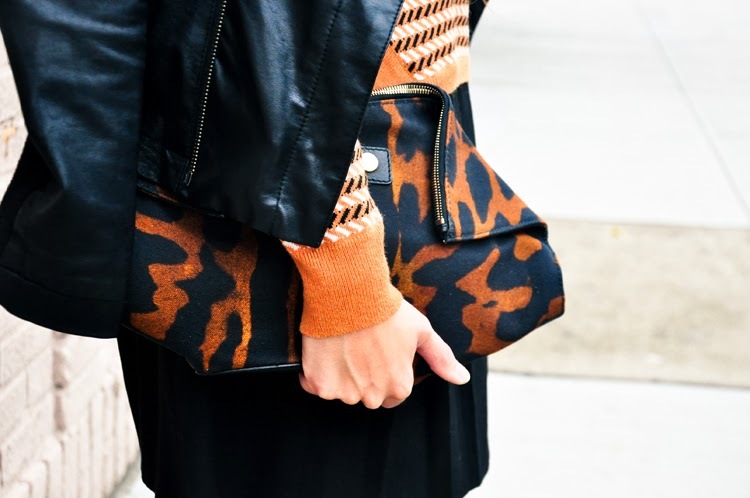 Loving the clutch, it makes such a delightful contrast with the sweater. that leather jacket is perfect! check out my chloe + isabel giveaway! I love the clutch and the sweater. I love incorporating prints in my clothing choices when i can. That bag is GORGEOUS!!!! Need it in my life!! Great blog and style you have babe! Big kiss!! Be sure to enter my blog giveaway to win a $50 Giftcard to House of Boutiques! I LOVEEEE that sweater and the bag. both are so unique. This look is perfect!! I fall in love with the jumper! I love this so much. I think it's the boots, they're perfect. Thank you for your lovely comment. The print combination in Micol's outfit works so well!